This is one of those lazy morning breakfast recipes, exactly what I need for the last three weeks of my holidays. I know three weeks sounds like a lot but when you compared it to the 4 months that my holidays last it is actually not a lot :) Sorry boasting about my student life is over now. Back to the food now, even better back to the breakfast food. This is for the lazy breakfast at 11 made with a cup of tea in hand and newspapers waiting on the table. I have bought a cookbook, again. It is called Deník Dity P. which translates to Diary of Dita P. And I am obsessed with it, like with all of the ones before. I even took this one with me when I went away for the weekend. Not really to read as I have already looked through it so many times but to show everyone else what and amazing cookbook it is. So there I was showing boring all my friends with a cookbook, most of whom don’t really cook beyond pasta with jar of sauce. Yup that actually happened. The recipe is from the ‘Hangover Cure’ section but I honestly think it is good for any morning not only the alcohol-affected ones. 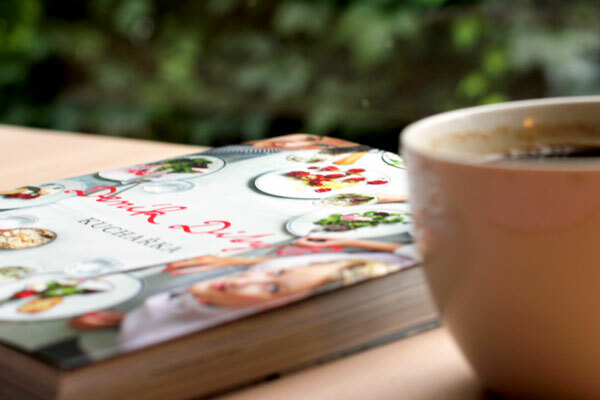 Unfortunately the cookbook is in Czech so it isn’t really for everyone, but the pictures are so pretty it worth having look even just at those. First roast the tomatoes with a bit of olive oil and black pepper. 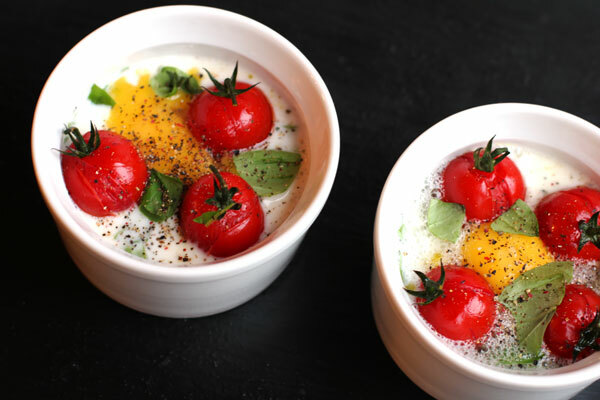 Whip the egg whites with cream, basil and seasoning. 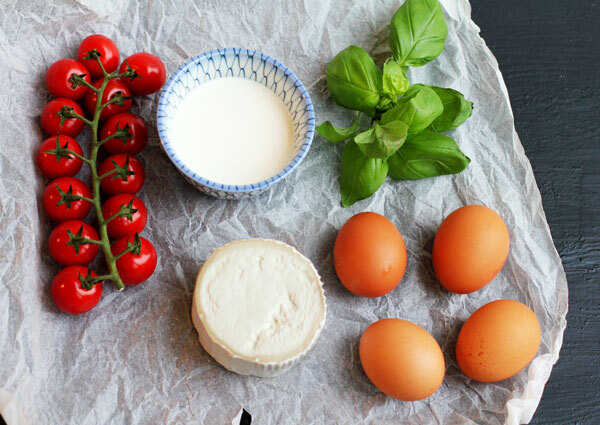 And now just assemble the cup, starting with a slice of goat cheese log and topping with cherry tomatoes and egg yolk. Sprinkle with some extra basil and bake. Bake until your desired doneness and serve with a slice of crusty bread. Eat slowly with your favourite newspaper and a cup of tea/coffee. 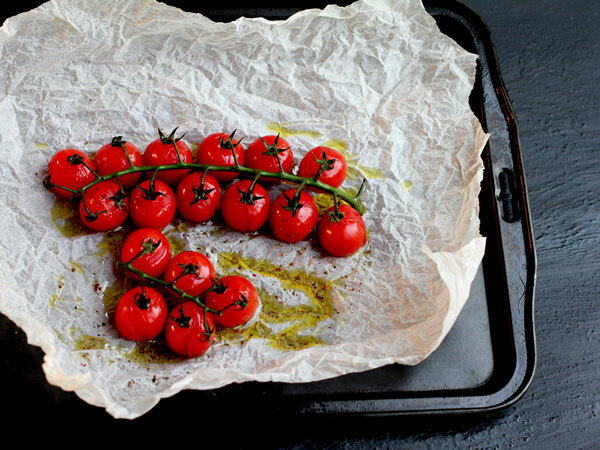 Put the cherry tomatoes on a baking tray, drizzle with olive oil and sprinkle with some ground pepper. Bake the tomatoes for 15 minutes until soft but not completely mushy. 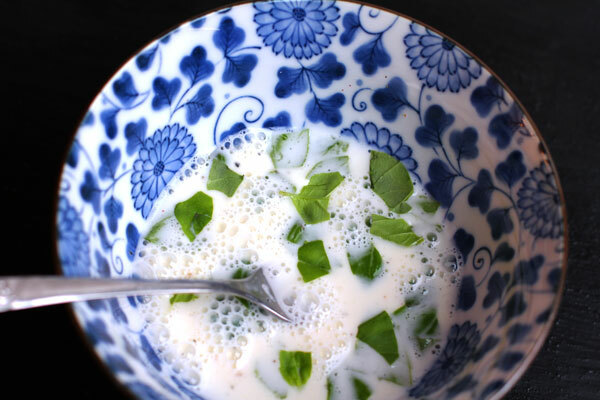 Whisk all of the egg whites with cream and add most of the basil, season with salt and pepper. 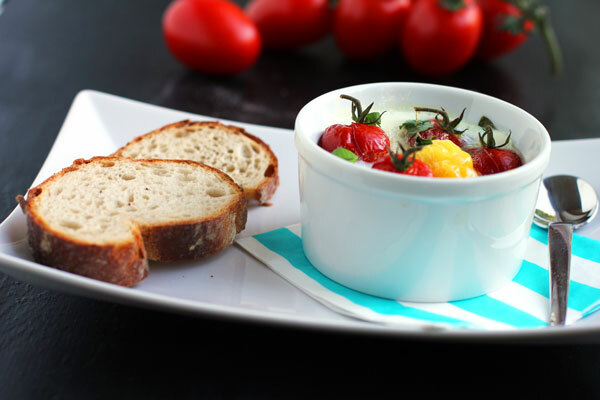 Put the goat cheese into the bottom of a ramekin and pour over the egg white mixture. 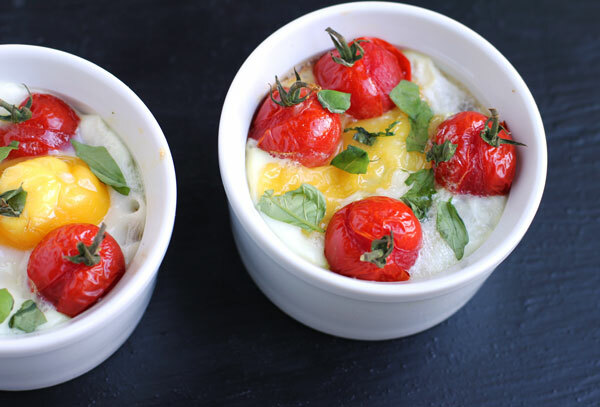 Put cherry tomatoes and egg yolk on top and sprinkle with the remaining basil. Bake for 15-20 minutes depending on the desired doneness of the eggs. Barborko, vypadá to moc krásně – rajčátka, vajíčka, mňam, ještě musím sehnat kozí sýr, zdraví babička. Dekuju, ty by jsi mozna nasla i nejaky z mistni z nejake farmy ne? Dekuju, a urcite doporucuju je to moc dobry a urcite to jde i jenom s bilky.